IGN just released two new TV spots for the Ratchet and Clank Movie. You can view them below. I will admit, both TV spots show a bit too much "sheep." Add that to the cheezy beat-boxing scene at the end, and you'll feel like Qwark does right now! On a positive note, we do get to see more of characters like Elaris, Grimroth Razz, Cora, Drek, and Nefarious. The second clip takes on the cliche of having each character say "Ratchet" and "Clank" every second. One thing I did not expect was to see Dallas Wannamaker, Juanita's news partner, get a scene. Aside from the fact that he's bald, his look is very much the same from the original, in Deadlocked. In fact, his voice actor may have made a return. 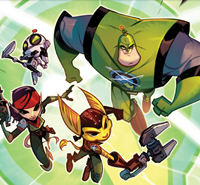 Ratchet and Clank certainly kick one villian's asteroid in these TV spots: Dr. Nefarious! He is seen not only armed with a Sheepinator, and an Alpha Disruptor, but also a RYNO IV! It is possible that these TV spots will be shown during the Super Bowl as well, so for those of you willing watch The Broncos beat the Panthers in an awesome victory, you may want to tune in to that. 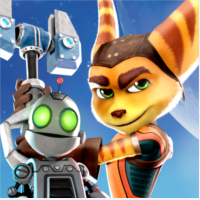 For more news the Ratchet and Clank Movie, as well as the game, stay tuned to Ratchet Galaxy. That RYNO IV makes 10 weapons from Tools of Destruction. "That RYNO IV makes 10 weapons from Tools of Destruction." i take it that you dont want more TOD weapons? So, I tried to make something out of the text in the Dallas picture. The first sentence is "What's next for Ratchet". Under that the first thee letters are "..orp" probably from "Megacorp" as the remaining sentence is "…orp announces work on mysterious new product - Protopet. The next sentence is " Zoni - Are they fact of fan fiction?" Oh, and I really hoped Dallas had hair! He was so much better with his wig. I wonder why isn't he with Juanita. Hasn't he met her? 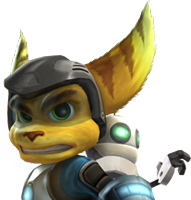 I don't think so as from the text "What's next for Ratchet" it seems it is towards the end. That it says Protopet on the news is rather interesting. Perhaps they're teasing a remake of GC as well? Or maybe GC story will somehow blend into this one, which would be kind of odd. Ah, I'll just be optimistic. I WILL see the movie and play the game!